For the bird with the scientific name Vultur gryphus, see Andean condor. The griffon vulture (Gyps fulvus) is a large Old World vulture in the bird of prey family Accipitridae. It is also known as the Eurasian griffon. It is not to be confused with a different species, Rüppell's griffon vulture (Gyps rueppellii). It is closely related to the white-backed vulture (Gyps africanus). The griffon vulture is 93–122 cm (37–48 in) long with a 2.3–2.8 m (7.5–9.2 ft) wingspan. In the nominate race the males weigh 6.2 to 10.5 kg (14 to 23 lb) and females typically weigh 6.5 to 11.3 kg (14 to 25 lb), while in the Indian subspecies (G. f. fulvescens), the vultures average 7.1 kg (16 lb). Extreme adult weights have been reported from 4.5 to 15 kg (9.9 to 33.1 lb), the latter likely a weight attained in captivity. Hatched naked, it is a typical Old World vulture in appearance, with a very white head, very broad wings and short tail feathers. It has a white neck ruff and yellow bill. The buff body and wing coverts contrast with the dark flight feathers. Like other vultures, it is a scavenger, feeding mostly from carcasses of dead animals which it finds by soaring over open areas, often moving in flocks. It establishes nesting colonies in cliffs that are undisturbed by humans while coverage of open areas and availability of dead animals within dozens of kilometres of these cliffs is high. It grunts and hisses at roosts or when feeding on carrion. The maximum recorded lifespan of the griffon vulture is 41.4 years for an individual in captivity. It breeds on crags in mountains in southern Europe, north Africa, and Asia, laying one egg. Griffon vultures may form loose colonies. The population is mostly resident. Juveniles and immature individuals may migrate far or embark on long-distance movements. Griffon vultures eating the carcass of a red deer in the Pyrenees (Spain). In Italy, the species managed to survive only in the island of Sardinia, but a few attempts at reintroducing the griffon in the peninsula have been recently made, too. As a result, several specimens have been spotted again in August 2006 on the Gran Sasso massif (central Italy). Populations in Italy are thought to be undergoing a vigorous increase, thanks to reintroduction schemes in neighbouring countries taking effect, and a ban on hunting the species. In the United Kingdom, griffon vultures were made extinct at some point before the 1600s. Occasional vagrants appear in the UK, and in 2000 a vulture took up residence on the Channel Island of Guernsey. In Cyprus, there is an unsustainable colony of fewer than 30 birds (2016) at Episkopi, in the south of the island. Colonies of griffon vultures can be found in northern Israel and in the Golan Heights, where a large colony breeds in the Carmel Mountains, the Negev desert and especially at Gamla, where reintroduction projects are being carried out at breeding centers in the Carmel and Negev. In Greece, there are nearly 1000 birds. On Crete they can be found in most mountainous areas, sometimes in groups of up to 20. Griffon vultures have been reintroduced successfully into the Massif Central in France; about 500 are now found there. Griffon vultures are regularly spotted over the Millau bridge. In Belgium and the Netherlands, around 100 birds were present in the summer of 2007. These were vagrants from the Pyrenees population (see below). In Germany, the species died out in the mid-18th century. Some 200 vagrant birds, probably from the Pyrenees, were sighted in 2006, and several dozen of the vagrants sighted in Belgium the following year crossed into Germany in search for food. There are plans to reintroduce the species in the Alps. In September 2008, pieces of a griffon vulture bone, about 35,000 years old, were excavated from Hohle Fels cave in southern Germany, which are believed to form a flute. In Serbia, there are around 60–65 pairs of griffon vultures in the western parts of the country, around Zlatar mountain and also 35 birds in the canyon of the Trešnjica river. They are under legal protection from hunting. In Switzerland, there is a population of several dozen birds. In Austria, there is a remnant population around Salzburg Zoo, and vagrants from the Balkans are often seen. In Spain and France, in 2008, there were 25.000 birds, from a low of a few thousand around 1980. Spain has the biggest colony of Griffon vultures in all Europe. It is located at Hoces del Río Duratón Natural Park (Province of Segovia). The Pyrenees population has apparently been affected by an EC ruling that due to danger of BSE transmission, no carcasses must be left on the fields for the time being. This has critically lowered food availability, and consequently, carrying capacity. Although the griffon vulture does not normally attack larger living prey, there are reports of Spanish griffon vultures killing weak, young or unhealthy living animals as they do not find enough carrion to eat. In May 2013, a 52-year-old woman who was hiking in the Pyrenees and had fallen off a cliff to her death was eaten by griffon vultures before rescue workers were able to recover her body, leaving only her clothes and a few of her bones. Due to her being the first human to be documented being eaten by griffon vultures, the story brought worldwide attention to the griffon vulture problems in Southern Europe. In Armenia there are 46-54 pairs according to last estimation of population; the trend demonstrates slight increasing. The main cause of the rapid decline in the griffon vulture population is the consumption of poisoned baits set out by people. Wildlife conservation efforts have attempted to increase awareness of the lethal consequences of using illegally poisoned baits through education about the issue. Griffon vultures have been used as model organisms for the study of soaring and thermoregulation. The energy costs of level flight tend to be high, prompting alternatives to flapping in larger birds. Vultures in particular utilize more efficient flying methods such as soaring. Compared to other birds, which elevate their metabolic rate to upwards of 16 times their basal metabolic rate in flight, soaring griffon vultures expend about 1.43 times their basal metabolic rate in flight. Griffon vultures are also efficient flyers in their ability to return to a resting heart rate after flight within ten minutes. As large scavengers, griffon vultures have not been observed to seek shelter for thermoregulation. Vultures use their bald heads as a means to thermoregulate in both extreme cold and hot temperatures. Changes in posture can increase bare skin exposure from 7% to 32%. This change allows for the more than doubling of convective heat loss in still air. Griffon vultures have also been found to tolerate increased body temperatures as a response to high ambient temperatures. By allowing their internal body temperature to change independently of their metabolic rate, griffon vultures minimize their loss of water and energy in thermoregulating. 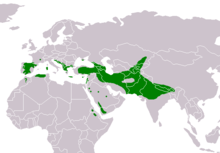 One study in particular (Bahat 1995) found that these adaptations have allowed the Griffon vulture to have one of the widest thermal neutral zones of any bird. In respect to varying age ranges, the griffon vultures evidently show no difference in feeding rates. Inevitably, as resource availability increases, feeding rates tend to follow the same pattern. Upon studying the reintroduction of this species and its impact on the intraspecific competition, old adults are more inclined to display aggressive behavior and signs of dominance in comparison to the other age ranges. In terms of comparing the male and female sexes, there are no observed differences in competitive behaviors. Lastly, the reintroduced individuals of the species and the wild-bred do not differ in dominance or feeding rate despite the differences in upbringing. ^ Ferguson-Lees, James; Christie, David A. (2001). Raptors of the World. Illustrated by Kim Franklin, David Mead, and Philip Burton. Houghton Mifflin. ISBN 978-0-618-12762-7. ^ Ali, Sálim (1996). The Book of Indian Birds (12th ed.). Bombay: Bombay Natural History Society. ISBN 978-0-19-563731-1. ^ Gavashelishvili, A.; McGrady, M.J. (2006). "Breeding site selection by bearded vulture (Gypaetus barbatus) and Eurasian griffon (Gyps fulvus) in the Caucasus". Animal Conservation. 9 (2): 159–170. doi:10.1111/j.1469-1795.2005.00017.x. ^ Gavashelishvili, A.; McGrady, M.J. (2006). "Geographic information system-based modelling of vulture response to carcass appearance in the Caucasus". Journal of Zoology. 269 (3): 365–372. doi:10.1111/j.1469-7998.2006.00062.x. ^ Carey, James R.; Judge, Debra S. "Longevity Records: Life Spans of Mammals, Birds, Amphibians, Reptiles, and Fish". Monographs on Population Aging, 8. Odense University Press. Retrieved 13 September 2011. ^ Gavashelishvili, A. (2005). "Vulture movements in the Caucasus". Vulture News. 53: 28–29. doi:10.4314/vulnew.v53i1.37634. ^ McGrady, M.J.; Gavashelishvili, A. (2006). "Tracking vultures from the Caucasus into Iran" (PDF). Podoces. 1 (1/2): 21–26. ^ Ettinger, Powell (2008). "Griffon vultures on Cres Island - Croatia". Wildlife Extra. ^ "Croatian Flora Fauna clear list". ^ Xirouchakis, Stavros (2005). "Selection of Breeding Cliffs by Griffon Vultures Gyps fulvus in Crete (Greece)". Acta Ornitohologica. 40: 155–161. doi:10.3161/068.040.0211. Retrieved 25 February 2019. ^ "Gänsegeier in Flandern" [Griffon vultures in Flanders]. n-tv (in German). 18 June 2007. Retrieved 20 June 2007. ^ "Großer Geier-Einflug über Deutschland" [Large vulture flight over Germany] (in German). Handelsblatt. 30 June 2006. Retrieved 20 June 2007. ^ "Gänsegeier in Deutschland" [Griffon vultures in Germany]. n-tv (in German). 22 June 2006. Retrieved 25 June 2007. ^ "Prehistoric flute in Germany is oldest known". Associated Press. Retrieved 24 June 2009. ^ "Earliest musical tradition documented in SW Germany". Science Centric. Retrieved 24 June 2009. ^ "Canyon of river Trešnjica". ^ "Zlatar tourist organization, Serbia". ^ MacKenzie, Debora (1 June 2007). "Starving vultures switch to live prey". New Scientist. Retrieved 20 June 2007. ^ "Woman Eaten By Vultures After Fall From Cliff". inquisitr. 6 May 2013. ^ Armenian Bird Census. "The State of Griffon Vulture in Armenia". Armenian Bird Census. TSE NGO. Retrieved 3 February 2018. ^ Gavrilov, V. M. (26 November 2011). "Energy expenditures for flight, aerodynamic quality, and colonization of forest habitats by birds". Biology Bulletin. 38 (8): 779–788. doi:10.1134/S1062359011080024. ISSN 1062-3590. ^ Duriez, Olivier; Kato, Akiko; Tromp, Clara; Dell'Omo, Giacomo; Vyssotski, Alexei L.; Sarrazin, François; Ropert-Coudert, Yan (15 January 2014). "How Cheap Is Soaring Flight in Raptors? A Preliminary Investigation in Freely-Flying Vultures". PLOS ONE. 9 (1): e84887. doi:10.1371/journal.pone.0084887. ISSN 1932-6203. PMC 3893159. PMID 24454760. ^ Ward, Jennifer; McCafferty, Dominic J.; Houston, David C.; Ruxton, Graeme D. (1 April 2008). "Why do vultures have bald heads? The role of postural adjustment and bare skin areas in thermoregulation". Journal of Thermal Biology. 33 (3): 168–173. doi:10.1016/j.jtherbio.2008.01.002. ^ Prinzinger, Roland; Nagel, B.; Bahat, O.; Bögel, R.; Karl, E.; Weihs, D.; Walzer, C. (1 October 2002). "Energy metabolism and body temperature in the Griffon Vulture (Gyps fulvus) with comparative data on the Hooded Vulture (Necrosyrtes monachus) and the White-backed Vulture (Gyps africanus)". Journal für Ornithologie. 143 (4): 456–467. doi:10.1046/j.1439-0361.2002.02039.x. ISSN 1439-0361. ^ Bahat O (1995) Physiological adaptations and foraging ecology of an obligatory carrion eater - the griffon vulture (Gyps fulvus) [PhD thesis]. Tel Aviv: Tel-Aviv University. 102 p.
^ Bose, Michela; Sarrazin, Francois (July 2007). "Competitive behaviour and feeding rate in a reintroduced population of Griffon Vultures Gyps fulvus". British Ornithologists' Union. 149 (3): 490–501. doi:10.1111/j.1474-919X.2007.00674.x. Wikimedia Commons has media related to Gyps fulvus. "Eurasian Griffon media". Internet Bird Collection. Audio recordings of Griffon vulture on Xeno-canto. This page was last edited on 14 April 2019, at 14:43 (UTC).